I know this has been done before by many people, but doing this list is a good way to show what kinds of books I prefer. Let’s you, our readers get to know me. Now these picks will be in no particular order, and I will be focusing on non superhero books. The selections on our lists are more geared towards readers who have either read comics a long time ago or have only ever read superhero books and feel they are just for kids but want to broaden their horizons. After a plague wipes out all mammal life on earth with a Y chromosome. Yorrick Brown and his monkey Ampersand are the only male mammals left on Earth. Yorrick finally leaves his apartment with Ampersand to reunite with his mom and sister who aren’t aware that Yorrick survived the plague. Before trying to make it to Australia to find his girlfriend to marry her. Y the Last Man really explores the breakdown in all aspects of the world in the wake of a major disaster. As well as facing the immortal question of “What would it be like to be the last man alive in a world full of women”. In the beginning it makes for a humorous story. Yorrick struggles through the world trying to keep his identity a secret (usually poorly) and find a way of getting to the people he cares about. But eventually it makes a shift into a deep story about what the world becomes. On his journey Yorrick is joined by the mysterious Agent 355, a special agent who makes it her mission to protect Yorrick. It is clear from the beginning that 355 isn’t telling the whole story of what she knows. And he is being chased by his own sister who is a part of a faction who wants to make sure that the “Age of Woman” never ends called the Amazons. And a group of Israeli soldiers led by a tough as nails soldier codenamed Alter. This series is one of two series that I feel are the best of the best when it comes to the comic medium. 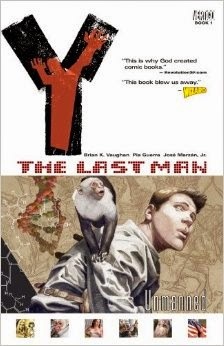 Vaughn and company take the reader for one hell of a trip in this book, and by the end Y the Last Man is an emotional roller coaster that all readers needs to take at sometime in their life. 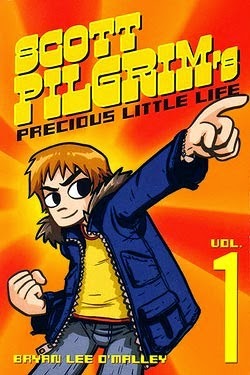 Scott Pilgrim is a twenty-something slacker with no real goals in life. And is dating a sixteen year old girl named Knives. Then he meets Ramona Flowers when she skates through his dreams one night. This one small event leads to Scott developing a serious fascination with her. When he finally lands a date with Ramona she informs Scott that before she can officially date him he must defeat her seven evil exes. What follows is a fun ride with callbacks to eighties video games and lots of other pop culture references. This series takes place over 6 trades each focusing on a single evil ex. The battles with her exes escalates with every battle. And each of the fights puts him closer to discovering the secret of the League of Evil Ex’s. As well as putting him at odds with his own angry ex, her disgruntled father, and multiple people in the same social circles who are not huge fans of Scott. The series is all done in black and white, very stylized art. Which really helps accent the fun nature of the story. Sometimes the art can be a little inconsistent, but it really gives the series an extra level of fun. This is the story of Dashiell Badhorse, who returns to the Prairie Rose Indian Reservation after fifteen years of being away. But the reservation Dash returns to isn’t the same as the one he left. The new tribal President Lincoln Red Crow is putting in a Casino on the “Rez”, but there are lots of people who are opposed to it. And even some people who are looking to take down Red Crow themselves. This series is a great showcase of the character studies you can do with the comic book medium. The series deals with politics, Alcohol and drug use, poverty, and organized crime. The story is told through the eyes of Dashiell for the most part, and through his eyes you learn of his past with many of the inhabitants of Prairie Rose and those that threaten it. I chose this series for the gritty beauty that inhabits every corner of the world it shows. Even though the characters are very flawed you can’t help but root for them to come out on top. It blurs the line between good and bad to the point that everybody exists in a grey area. Aaron writes amazingly human characters who are beautifully flawed and relatable. And Guera has an art style that compliments the dark nature of the story it is bringing to life. Just give it the first arc to hook you, and you won’t be disappointed. The story of how two girls lives spiral around each others and the effects they have on each other. 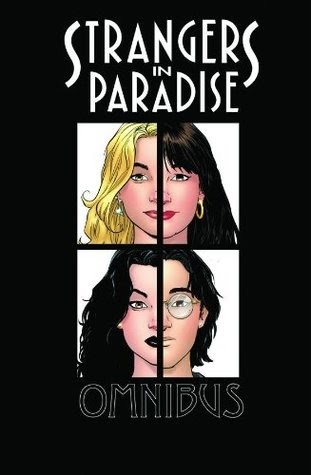 Strangers in Paradise is quite simply one of the best written series I have read. There is no real big action scenes or super villains looking to take over Metropolis in this book. It centers on Katchoo and Francine, two friends that meet in high school and can never really be too far from each other from then on. It is so human and beautiful. There is more to the story as it progresses, but I don’t want to ruin it for anyone who hasn’t already checked it out. But it is a great ride to take. There are a few small slow points throughout, but in the end even those serve their purpose. This series also really plays with the medium. Every once in a while there is an issue that treats the reader to the exploits of one the many side characters, Freddie Femur. These side stories are often done like old Sunday morning comic strips. Calvin and Hobbes and Peanuts for example. I chose this series for the feeling of realism it gives the reader. All of the characters feel like real people you may walk by on the street or hold the door for. Now this is a big technicality since it does involve some superhero characters, but the superhero aspects are really very secondary to the story to me. This has to be one of the most fun comics to read. The story is pretty simple. a low class prostitute who is down on her luck is given powers by an alien being who makes a bet with the computer A.I. on his ship that anyone can be heroic if they have powers. Let’s just say when she discovers she has powers she doesn’t use them with the most noble of intentions. Her new found abilities lead her to be noticed by the League of Honor, which is a take on the Justice League. I will leave the story there, because words don’t do justice to what happens next. Garth Ennis does a really good job of making the story fun and questionable as he always does. And he clearly has no love when it comes to his take on the JLA. But what really shines in this book is Amanda Conner’s art. Her style brings the unusual world of the Pro to life such a vibrant flare. This book made my list because it was one of the comics that got my wife to start giving more comics a chance. Before she read The Pro she only gave a few books a chance, and even the ones that she did try she wasn’t really impressed with. I have read most of this series, but after a while the story had gone as far as it should’ve and it started to feel like it’s natural ending point had past. That said for the first twelve or thirteen trades this series is flawless. The story is really good premise. All of the classic characters from fairy tales and nursery rhymes are driven from their homelands by an evil army lead by “The Adversary”. So they take up residence in the “Mundy” World. They set up their own community and government in a section of New York City. The first arc of the story focuses on a murder in the fairytale community. And while it doesn’t highlight what the rest of the series is about, it really serves to introduce the reader to what these versions of the classic characters are really like. Bill Willingham makes these classic characters his own throughout the run on this series. And every artist that gets a chance on this book makes the characters recognizable, but also gives them their own unique twists. 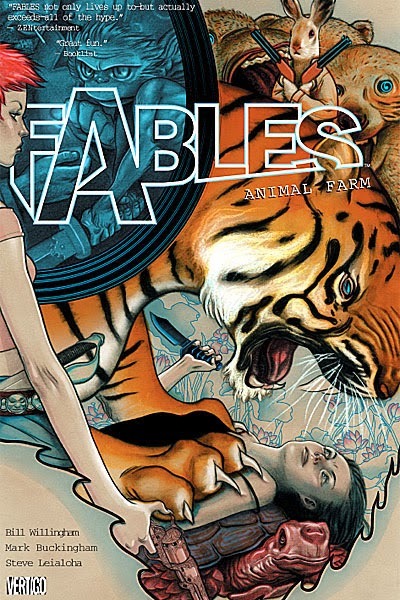 I chose Fables because it’s easy for most casual fans to read because all of the characters are from stories you can hear from disney movies and fairy tales all through their childhood. Yet it also delivers new takes on the characters to keep it interesting. I have read this series from the beginning and I am always excited to read a new issue when it comes out. It uses strong characters and paranoia to develop a great story. 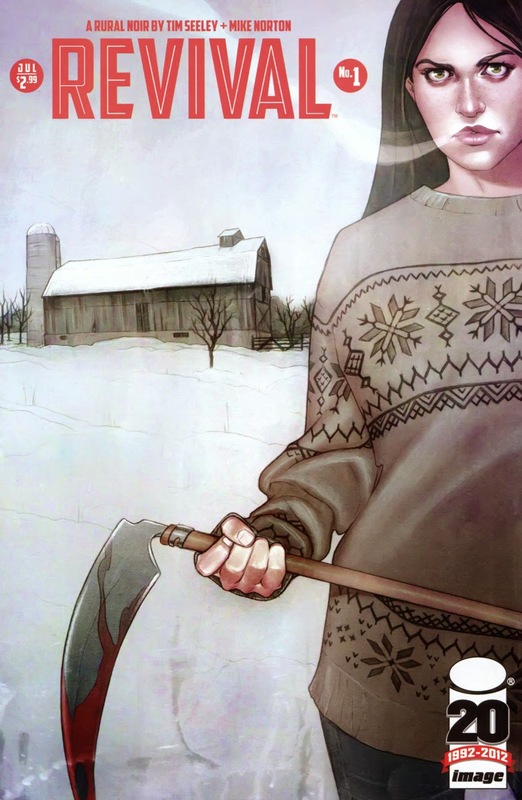 The focus of Revival is about a small town in Wisconson where a bunch of people came back from the dead in a completely unexplained event. The series starts months after “Revival Day” and Dana Cypress is responsible for figuring out the mystery of why. The CDC loans an agent to the town to help with the quarantine zone. A big part of this series is the focus on the fact that nobody knows who’s a reviver, because they look like regular humans. The revivers look normal, however most of them are mentally unstable due to the revival process and their inability to stay dead. This is the first book I have read that is written by Seeley, and he delivered with great characters and a very realistic world (minus the dead coming back that is). Norton has the knack to make the characters distinct despite their amount of winter clothes they all wear. And the emotions the characters display are amazing. Although this is a newer book, it made my list because of how perfectly it executes on the premise. You get a good amount of tender moments between the inhabitants of the town and moments that will leave you tense and wanting more. Well that is my list. There are other great series that I have really enjoyed like Preacher, but I left them off the list for good reasons. I really enjoyed making this list for you guys. I hope you guys enjoyed reading this as much as I enjoyed writing it. If you have any questions, comments, or suggestions please leave them in the comment section below. Thanks for reading this post. And keep on reading comic fans.